BROWNSVILLE — Last week, when she saw the viral photograph of an immigrant toddler sobbing as her mother was searched at the border, Rancho Viejo resident Leticia Rodriguez instantly thought of her grandchildren in Virginia. A similar thought occurred to Narce Uribe Scott as she listened to an audio recording of immigrant children crying in a U.S. Customs and Border Protection facility. On Thursday, Rodriguez and Uribe Scott joined more than 1,000 other demonstrators from across Texas in a park near the federal courthouse in Brownsville to protest the separation of undocumented children from their parents at the border. Although President Donald Trump issued an executive order last week calling for detained families to be kept together, the vast majority of the more than 2,000 children who were separated have yet to be reunited with their parents. 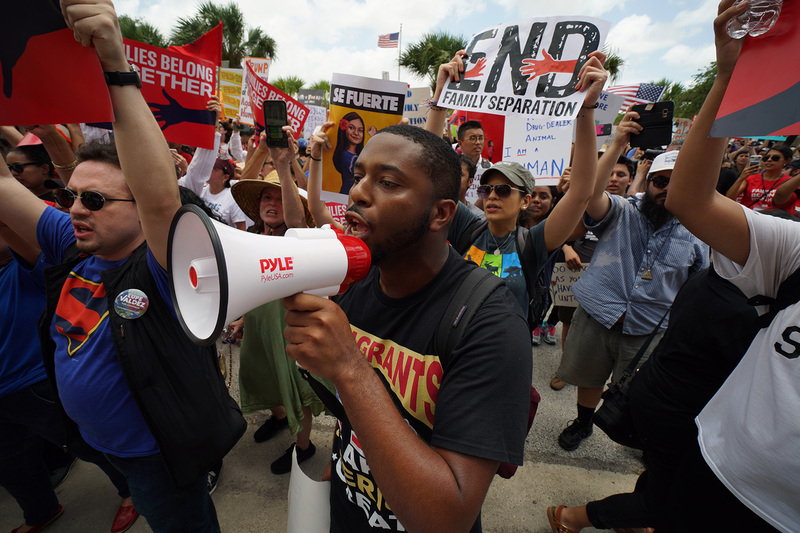 At the end of the rally, organized by the American Civil Liberties Union, hundreds of demonstrators marched across the street to the Brownsville courthouse, where migrant parents apprehended under the Trump administration's “zero tolerance” policy have been prosecuted. Chanting “Sí se puede!” and holding American and Mexican flags, the protesters rallied on the courthouse steps, while a small group walked inside. 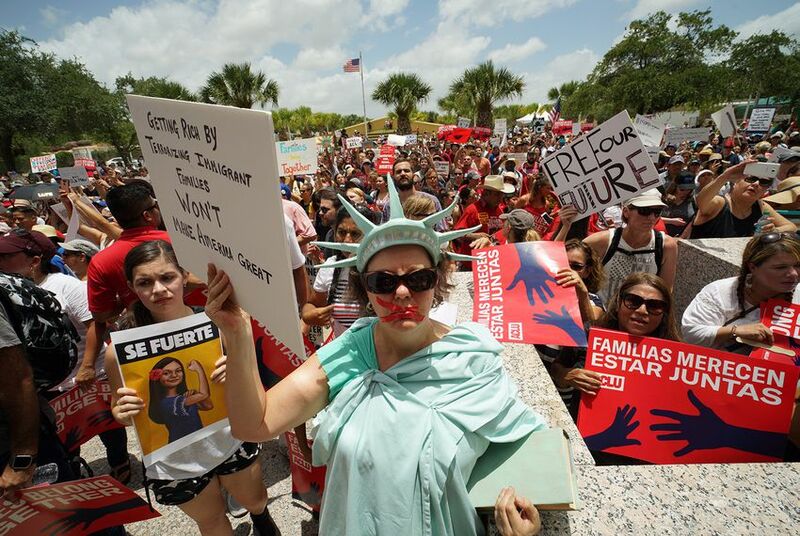 Demonstrators came to the rally on busses from Laredo, San Antonio, Austin and Houston, according to Imelda Mejia, communications coordinator for the ACLU’s Texas branch. Others flew into Texas from states as distant as Minnesota and Michigan. Organizers estimated that about 1,100 people attended. Zaira Garcia, the daughter of two undocumented immigrants, came down from Austin to protest outside the courthouse. Since Trump’s executive order last week, the government appears to have backed away from the zero-tolerance policy, in which immigration officials refer all unlawful border crossings for prosecution. And on Tuesday, in response to a lawsuit filed by the ACLU, a federal judge in California issued an injunction compelling the government to quickly reunite children with their parents. The injunction calls for children under the age of 5 to be reunited with their parents within two weeks, and older children to be reunited within 30 days. Even now that the government has stopped separating families, Democratic National Committee Chairman Tom Perez, who came to Brownsville for the rally, said immigration activists should keep up the fight.